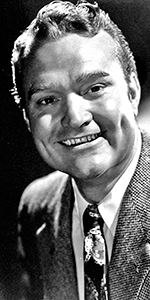 Red Skelton was among the newer comedians rising to prominence on radio and in movies in the 1940s. Likeable and warm, Skelton developed a number of comic characters and catchphrases, including the character called "Junior," who was always saying, "I dood it." Skelton acheived his greatest success on television, where he closed each broadcast by saying, "Good night, and may God bless." Born in humble circumstances, Skelton's father died before he was born. Having to work to help support the household, young Richard sold newspapers. One day, he sold papers to the headliner at the local vaudeville show, who invited him in to to see the show from the wings — Richard now knew what he would do with his life — make people laugh. In itinerant life of burlesque, minstel shows, showboats, and medicine shows followed, where Red would send all of his money back home to his mother Ida. He was MC at a dance marathon, when the winner told him his material stunk: Red asked if she could do better. Enda could and did; she began writing his material; they married in 1931. Edna tutored Red so that he could get his high school equivalency degree. After much hardship, Skelton got a gig at the Lido Club in Montreal in 1934. A chance to play in New York City caused the couple to develop their "Doughnut Dunkers" routine, which became a sensation in 1937. A performance at the White House tickled president Franklin D. Roosevelt, who became a fan of the comic. Hollywood became very interested in Red Skelton all of the sudden. He had a supporting role in R-K-O's Having a Wonderful Time (released in July, 1938), and did a couple of Vitaphone shorts in 1939. Mickey Rooney urged Skelton to test at M-G-M, who signed him on in 1940, appearing as a supporting player in Flight Command (which played the Chinese in January, 1941). He joined the cast of both Dr. Kildare's Wedding Day (played the Chinese in October, 1941), and The People vs. Dr. Kildare (played in June, 1941). An appearance on Rudy Vallée's The Fleischmann's Yeast Hour, led to his and Edna taking over Avalon Time on NBC until 1939. He became the star of the Raleigh Cigarette Program in October of 1941 on NBC, where he introduced the phrase "I dood it," along with his character Clem Kadiddlehopper as well as "Junior." With his success on radio, M-G-M boosted Skelton to star status, with his first starring vehicle being Whistling in the Dark (which played the Chinese in September, 1941). He was a major supporting player in the musical Lady Be Good (played the Chinese in October, 1941), and again in Ship Ahoy (which had just opened at the Chinese when Red came by to do his footprints — he helped mix the cement with Jean Klossner, and allowed Sid Grauman to make the impression of one of "Junior's" shoes. Before the cement dried however, someone defaced that footprint. The cement was wet enough to smooth it over, which is why it is missing today). Skelton was now a box-office power. More films came rumbling out: Du Barry Was a Lady (which played the Chinese in July, 1943), and his signature film comedy, I Dood It (played the Chinese in October, 1943). He headlined in Bathing Beauty (played in July, 1944). By now, Skelton had divorced Edna (who continued to manage his career), thereby loosing his draft exemption as a married man. He served in the Army and entertained troops extensively enough that he was hospitalized from exhaustion. He was discharged in September, 1945. Going back to M-G-M, he did a walk-on in Ziegfeld Follies (released in April, 1946), and starred in The Fuller Brush Man (released in June, 1948), but by this time, Skelton's eye was on television. His The Red Shelton Show premiered in September, 1951. The inventive show ran until 1953 on NBC. 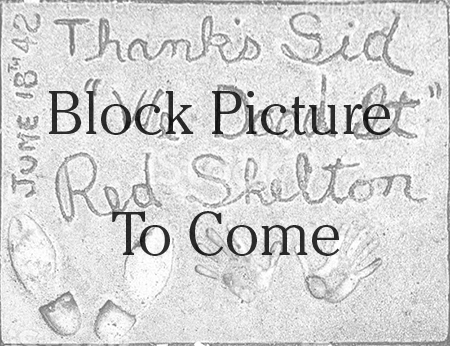 Red carrying the entire show was too much for him; Skelton wanted a variety-style program, so the show was revamped and put on by CBS in he 1935-54 season, shooting the show from Television City in Los Angeles. It ran until 1970, expanding to The Red Skelton Hour in 1962. After the show was cancelled, and bitterly disappointed at being off the air, Skelton took his act on the road, appearing at colleges and universities around the country. in the 1980s he did several television specials including Freddie the Freeloader's Christmas Dinner in 1981. He died of "undisclosed causes" in September, 1997 at the age of 84. Grauman's Chinese Theatre, Hollywood, California. Red Skleton Forecourt ceremony, Thursday, June 18, 1942. 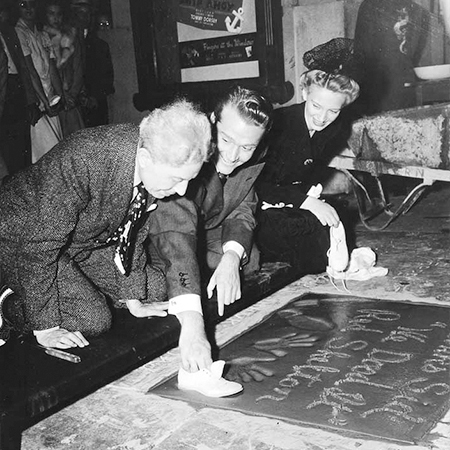 Sid Grauman presses "Junior's" shoe into the cement as Red Skelton and his wife Edna look on, with the mixing wheel barrow in the background.